Oh yes- well done you! It pays to route round Ma Watling's hidey holes! I had a 50% chance, and I got the one with Karen Gillan on the cover. Please don't tell me that Hartnell/Troughton footage is a fake? Yes Pip, sorry! (Au)Gus(tus) Honeybun was/is a rabbit puppet that used to read out the birthdays on Westward TV years ago - and apparently the stills come from an episode of something called 999. If it's any consolation, it took me a few minutes for the penny to drop! The footage is genuine. It's from an episode of a series called 'Dial 999' from 1958, and it really does star William Hartnell, Patrick Troughton and Robert Beatty. The story attached to it is total fabrication, however. There's a few things that give it away - it's unlikely (but not impossible) that if they ever shot test regeneration footage, Hartnell wouldn't be in costume. There's no reason at all why it would be shot in a field. And, most glaringly of all, there's no reason for Robert Beatty to be there (and he looks about ten years younger than he did in The Tenth Planet!). Still, quite a funny old thing to find footage of three people who were in "The Tenth Planet", in a different production, especially from 1958!! I assume the actual footage doesn't exist, or we could actually make our own regeneration! This totally fooled me, I'm not afraid to say! I did wonder why I'd read nothing about it elsewhere on the net, and indeed why no one was excitedly talking about it on here! 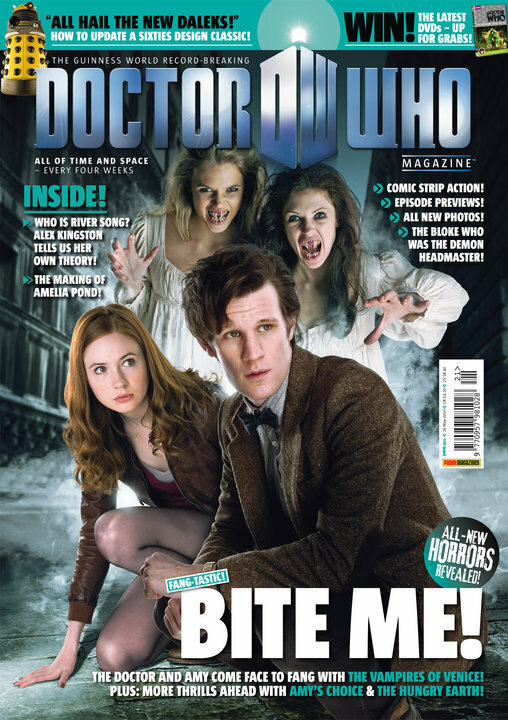 Will the magazine make better reading than the episodes made viewing?! Yes, look at that old Doctor Who up there! He's so... uh... 2010. Or maybe 2008. I don't know about better reading, but they could well be more coherent. New title crept in there - The Hungry Earth!! Is it a Frontios sequel? In which Doctor Who investigates farming quotas and subsistence payments in Eastern Europe. It could be friends with "The Stolen Earth"! Blimey! It was waiting for me when i got home from work today. They're really on the ball this month! That is a very good cover. I think the preview for "Amy's Choice" gives far too much away and I wish I hadn't read it now. I know you could say I shouldn't read it etc. but they usually just give you a taste of the episode and a few vague hints - but even only reading the "In summary" blurb at the bottom gives you one big spoiler, one MASSIVE spoiler and almost sums up the whole plot. I feel the episode's been ruined now. Damn. It does have 16 exclamation marks (!!!!!!!!!!!!!!!!) and a rogue question mark (?) so it must be good! The latest comic strip is several new shades of wretched though. They've really got to stop trying to be an episode of the TV show and do their own thing. Do the scripts get approved by the DW office? It's getting harder and harder to make the old series DVD reviews interesting as well. There's been so much in-depth writing about every story over the years, but the reviews aren't trying to do anything new or interesting. I suppose for 'new' fans it's useful, but for me the reviews which used to be one of the highlights of the magazine are a real chore to get through. I was surprised by how poor the reviews of the new series were too - pretty lightweight given that these were the articles that genuinely had the chance to say something new. And why is the likeness of Matt Smith so much better in the DWA comic strip than in DWM ? Because they've employed Mike Collins again!